The device allows up to 32 users to connect at a time, including 31 on Wi-Fi and one via USB. 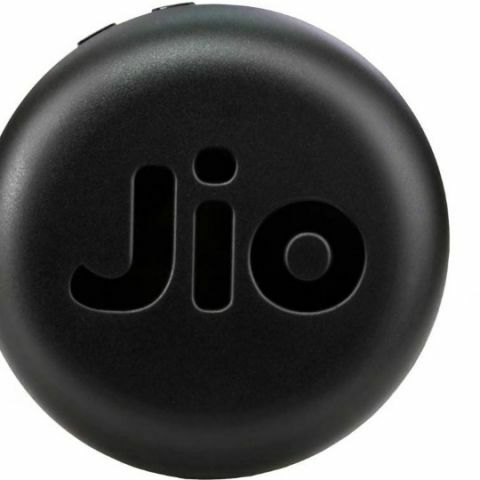 Reliance Jio has launched a new wireless data card, the JioFi JMR815 priced at Rs 999. The device can be purchased exclusively via Flipkart and it is also available with a no-cost EMI option if bought using HDFC Bank Credit Cards and those buying the device using an Axis Bank Buzz credit card can avail a 5 percent discount as well. It claims of delivering download speeds of up to 150Mbps and upload speeds of up to 50Mbps and comes with a one year warranty. Like the previous models, the new JioFi JMR815 supports VoLTE via the Jio 4G Voice App and comes with an expandable 64GB memory capacity. The new JioFi model comes with some design changes and it is now puck shaped. It carries a designed in India branding on the rear as well and features power and WPS buttons. It sports notification lights for indicating battery life, 4G, and Wi-Fi signal strength. The device is powered by a 3000mAh battery, which promises up to eight hours of battery life and requires 3.5 hours for being fully charged. It is powered by an ALT3800 processor and supports FDD-Band 3, Band 5, and TDD-Band 40. Speaking of Wi-Fi hotspot, Reliance Jio is reportedly in plans for providing internet via Wi-Fi hotspots across the country. The move is said to reduce the telcos network congestion and free up the spectrum for improving data speeds and reducing call drops. According to a previous report, the company has set up around 100,000 base stations pan India and aims to double the number in the coming year.